Recorded April 1968 in the Usher Hall, Edinburgh. I bought this disc out of sheer curiosity, and to benefit from the rebates on postage cost for combined shipment on purchases from eBay. Well, I came, I heard – and I left. No wonder, as the excellent liner notes aptly put it, that this generation of British composers, who came to maturity at the turn of the 20th Century, was overshadowed by Elgar. It is so influenced by German music, especially Wagner and Strauss, and by Tchaikovsky, as to present (to my ears) little originality, except that of being British. In a way, the generation was overshadowed more by Vaughan Williams, Britten and Tippett than Elgar: they proved that British music was capable of producing music of more personality than the Wagner-Strauss-Tchaikovsky influenced model. 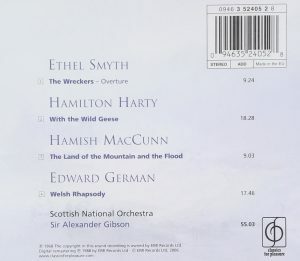 Ethel Smyth‘s overture to her most famous opera (out of six), “The Wreckers” from 1906, is suitably dramatic, evocative and not without its share of bombast, with many echoes of Wagner and a few whiffs of Brahms. It sounds to me like run-of-the-mill night at the Opera a century ago. Two years before, Puccini had composed Madame Butterfly and the previous year Strauss had completed Salome. But Ethel Smyth shouldn’t be judged on that alone: her earlier String Quintet and String Quartet are much more appealing. Hamilton Harty is the Irishman here and best remembered as a conductor. As a composer, his descriptive tone poem “With the Wild Geese” points to Tchaikovsky and Strauss. Nothing to do with wildlife, by the way: it is about “the Irish soldiers who fought for France at the Battle of Fontenoy in 1745”. It is hardly original, but has its evocative moments. At 18:28, it is also way too long. Ever heard of Hamish MacCunn (1868-1916)? If you have, then you are more knowledgeable than I am in obscure British (and, in this case, Scottish) composers. Like Harty, he seems to have been more active as a conductor and died at 48. 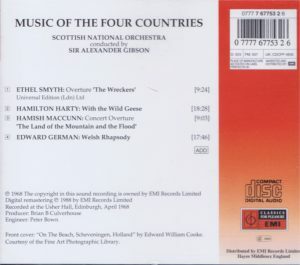 The liner notes (reprinted from the original 1968 release) claim that he was the conductor of the first British performance of Tristan, but I owe to the Gramophone online archive and the original review of this disc back in 1968 that it was in fact the first performance in English language. He wrote his Concert-Overture “The Land of The Mountain and the Flood” at 19. 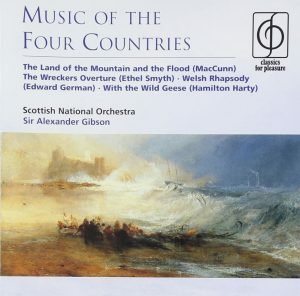 Maybe because it is the earliest composition in this collection, it harks back to Mendelssohn, Meyerbeer and early Wagner (think of the spinsters’ chorus in Flying Dutchman). But it is colorful and lively. Colorful and lively: I’d say the same of Edward German‘s Welsh Rhapsody, in the form of a four-movement symphony based on Welsh tunes and played without break. 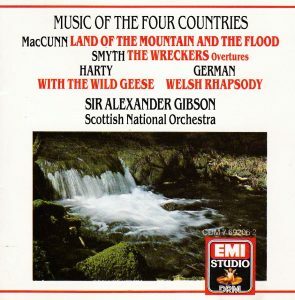 If you assume from the work’s title that German (1862-1936) is the Welshman in this sample of composers from the four nations that make the United Kingdom – not quite: he was in fact a Shropshire lad, born in Whitchurch, and only of Welsh descent. For all its derivativeness and despite the negative comments I read from reviewers on the various Amazons, but also from the reviews in Gramophone, his is the piece I found overall the most enjoyable on the disc. Think of Tchaikovsky’s ballets and you’ll get an idea – and German’s is a good imitation (despite its moments of maudlin sentimentality). German was also seen in his days as an heir to Sullivan. I confess to not being familiar with the music of Sullivan, but it possibly sounds that way, too. That said, why setlle on German when you have Tchaikovsky (and Sullivan)? Ultimately, I’m glad to be a music lover today in the global world, and not one confined to Great Britain in the days of Edward VII. 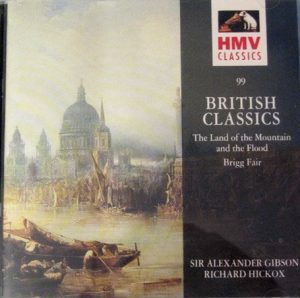 TT 55 minutes (but the disc was reissued on the “HMV Classics” series with a complement, Delius’ Brigg’s Fair with Hickox conducting the Bournemouth Symphony Orchestra). 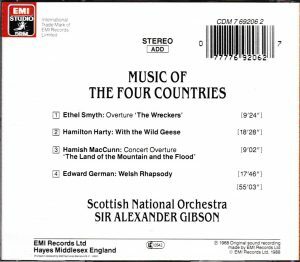 Gibson and the Scottish Chamber Orchestra seem to play excellently and the 1968 sonics remain excellent. My copy has been for sale ever since I first wrote this review in 2009 – and still not sold.